The GearWrench 3/4'' Micrometer Torque Wrench 100-600 ft/lbs features a 36-tooth ratchet mechanism with a 10 degree swing arc, a twist locking collar that provides a secure locking mechanism, and a stamped scale on beam and thimble collar for durability and visibility. Also featured on the GearWrench 3/4'' Micrometer Torque Wrench 100-600 ft/lbs is the pliable, elastomer handle grip for superior comfort and oil and solvent resistance, is accurate in clockwise direction +/- 3% from 20% to 100% of full scale, meets ISO 6789 specifications and is calibrated on test equipment complying with accuracy requirements of ASME B107.300-2010, and meets or exceeds ASME B107.14M 1994. The 85065 GearWrench 3/4'' Micrometer Torque Wrench 100-600 ft/lbs is one of thousands of quality tooling products available from MRO Tools. Please browse GearWrench Specials for tools similar to the 85065 GearWrench 3/4'' Micrometer Torque Wrench 100-600 ft/lbs. 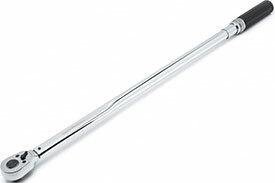 85065 GearWrench 3/4'' Micrometer Torque Wrench 100-600 ft/lbs description summary: GearWrench 3/4'' micrometer torque wrench 100-600 ft/lbs Quantity discounts may be available for the 85065 GearWrench 3/4'' Micrometer Torque Wrench 100-600 ft/lbs. Please contact MRO Tools for details.